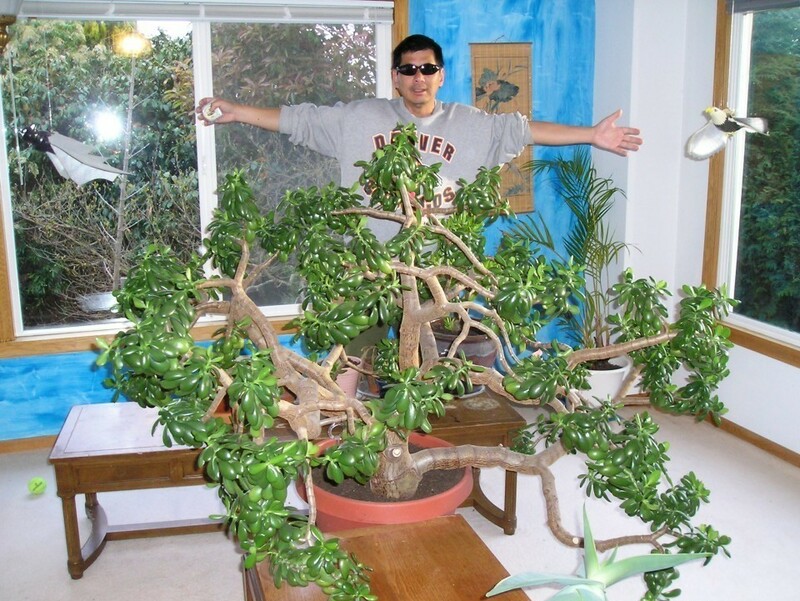 This entry was posted in largest Jade and tagged jade plant on April 13, 2010 by chrisgoh1. I’m in love with your jade plants! They are incredible, especially the large one. I have some sort of succulent that looks like the trailing one you pictured but I have no idea if it is a jade. I just pick up interesting succulents whenever I see them at Home Depot and bring them home. I hope one day my trailing beauty grows as much as yours! Thanks for sharing your pics and jade know how. Mine is 6.5 feet tall, from the dirt, but only 14.5 inches at the base. I strut it with some twine so that it doesn’t fall over. I got it when someone sold their house a couple of years ago; they wanted to get rid of it. So, I don’t know the age or the provenance. I think the pot is too small and it has been shedding a lot of leaves the last 6 months. Over watering (I think) really causes it to drop leaves. I hope it isn’t dying. I have a very large jade plant, whose branches all getting unsightly. I was wondering if I can cut them and start a bunch of new jade plants with them? One branch is so huge its like its own jade plant! Of course you can prune the stalk and put them in a pot. There is some solid information on this page. I am in love with your blog so far. I’ve added you to my boomarks and will continue reading your work. I did have an issue with how fast this blog entry loaded. Might be a problem to look into. Carlos, yes I have own that kind of jade plants and they are called Money Tree. They are very sensitive to heat and cold and when they are cold, they go in dormant mode. If you want them to grow during winters, make sure the temperature is warm and nice. By the way, where are you at?